Did you “Find Your Park” in 2016 to help celebrate the 100th birthday of the National Park Service? This was the theme throughout the year on TV, radio, special events and special programming. If you didn’t visit a park, apparently you were one of the few who stayed away. The year 2016 will likely go down in the record books as the largest jump ever in year-to-year visitation for most national parks. Final 2016 numbers show Glacier was up 20 percent, Yosemite +20 percent, Zion +18 percent, Arches +13 percent and Crater Lake +23 percent (Figure 1). Yellowstone and Grand Canyon were up 4 percent and 8 percent respectively, but that follows increases of 17 percent and 16 percent in 2015. 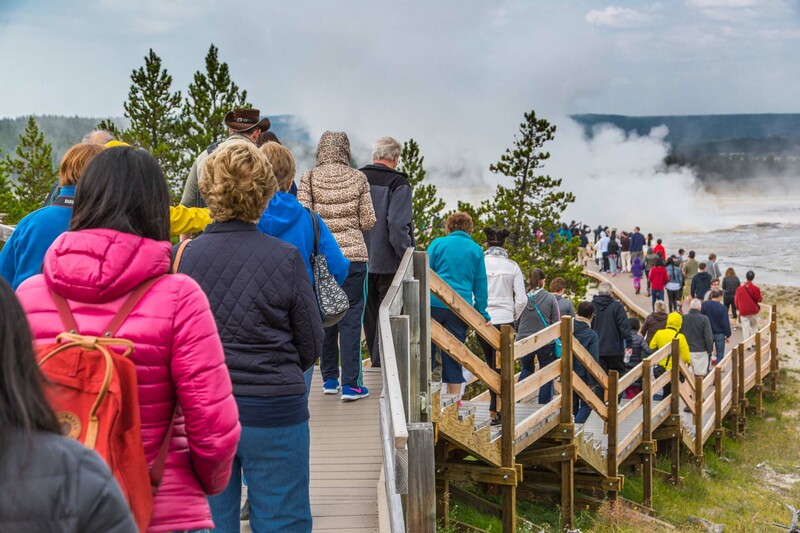 While national park managers were prepared for a good year, many were trying to respond to an unprecedented increase in visitation that simply did not stop – each month broke the previous years’ month visitation record. With Glacier and Yellowstone being Montana’s premier vacation destinations drawing nearly half of all nonresident visitors to one or both parks, how do these destinations deal with the unprecedented growth? Many say the parks are crowded. There are lines to get through entrance gates, lines at the bathrooms, campgrounds full by mid-morning and traffic is rush-hour-like on park roads. With duties similar to those of a mayor and city council, Glacier and Yellowstone managers have responsibility for public services, such as police, fire, sanitation, water, gas, roads and so on to provide a healthy living environment and to keep citizens safe. Along with that add the National Park Service mandate to “promote and regulate the use of the Federal areas known as national parks, monuments, and reservations…by such means and measures as conform to the fundamental purpose to conserve the scenery and the natural and historic objects and the wildlife therein and to provide for the enjoyment of the same in such manner and by such means as will leave them unimpaired for the enjoyment of future generations.” The mission – preservation of wildness for the enjoyment of the people – is appealing, but difficult to accomplish. Parks have the societal challenges of managing a city alongside a societal mandate to protect the wildlife, waters and vegetation from the people and for the people. Increased visitation is taking its toll on daily operations. In 2015, (with visitation up 17 percent) motor vehicle accidents with injuries were up 167 percent. Search and rescue incidents were up 61 percent. Emergency medical responses were up 37 percent and Life Flight evacuations were up 25 percent. These statistics parallel those of a city, but within a national park. The resource management side has an entirely different set of challenges from those visitors. Results from Yellowstone National Park researchers observing people in Yellowstone on four separate days this past summer showed that 226 total visitors were seen off the boardwalk/trail system in Norris Geyser Basin between 9:30 a.m. and 3 p.m., equating to an average of one person every six minutes ignoring the regulations. 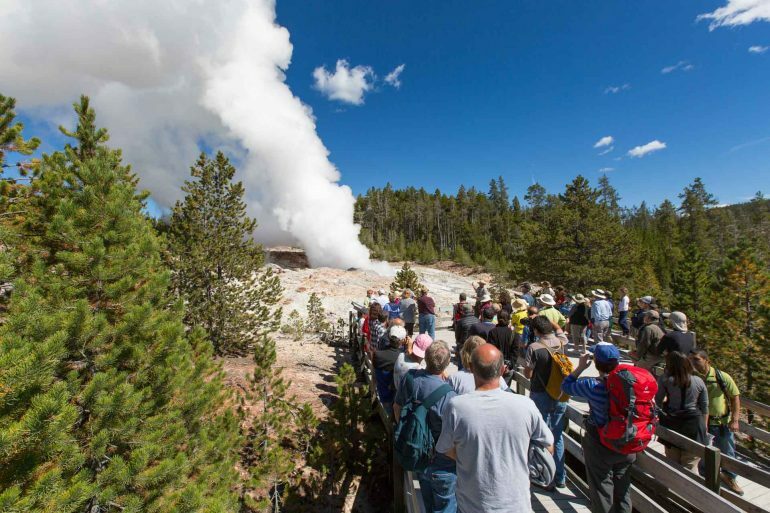 This compares to 128 violations at Old Faithful and six violations at Midway Geyser Basin in four days. Figure 1. A Day in the Life of Yellowstone. Source: Yellowstone National Park, Ryan Atwell. 2 arrests before 9 a.m.
4 major motor vehicle accidents (MVA) in the Old Faithful/Grant Area. 1 interagency assist for an MVA with extraction and injuries north of Gardiner. 2 MVA with no injuries at Canyon and Old Faithful. 2 cases of domestic violence (at the same time) at Old Faithful. 2 injuries with carry outs in the Canyon area. 1 ground transport for a back injury from Norris Geyser area. 1 interagency assist for a horse accident near Cooke City. 1 medical in the Madison campground for a visitor who sprayed herself with bear spray. High visitation numbers have been an economic boom to gateway communities. Third quarter resort taxes in West Yellowstone hit the $1 million mark in 2013, which increased by 13 percent in 2014, 10 percent in 2015 and 9 percent in 2016. 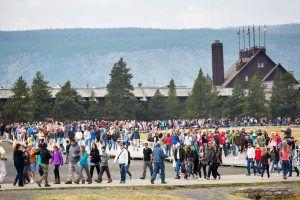 On the other hand, the large visitor numbers have pushed water and sewer facilities to their capacity during the summer in West Yellowstone. 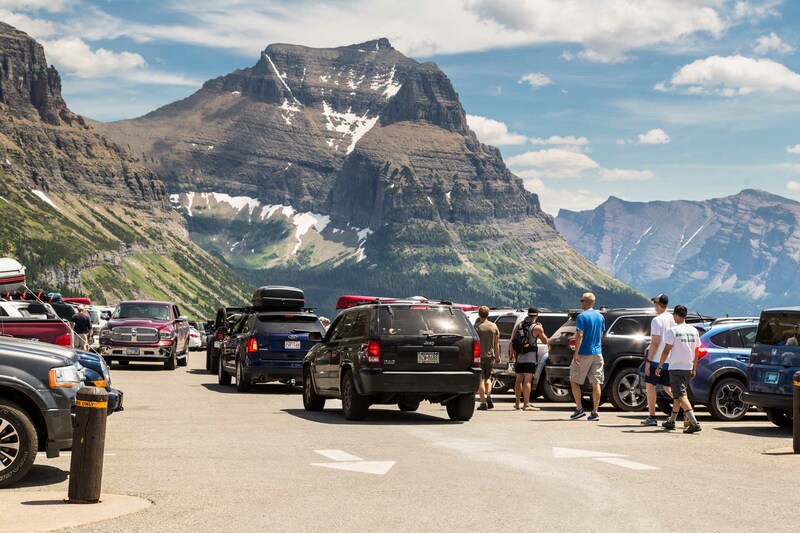 In Glacier National Park, it has been common for Logan Pass parking lot to completely fill up by 11 a.m. during July and August. 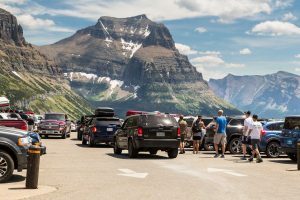 Now, even with a shuttle system in place to transport people along Going-to-the-Sun Road, the parking lot is full by 9 a.m. most days. Apgar, the largest campground in Glacier with 194 sites, only had six total days in July and August with sites available. The other three large campgrounds did not have a single July day with an open vacancy. August was similar with only two days where vacancies existed in the larger campgrounds. Viewing the scenery along the Going-to-the-Sun Road (GTSR) is what most people do while in Glacier. Day hiking is the second most sought out activity. The Avalanche Lake trail is evidence of the extreme increase in hikers. According to data from Glacier, in 1988 about 30,000 people hiked the trail during the entire season compared to 90,000 in 2011. Similarly, the Highline Trail down to the loop on the GTSR saw about 1,800 hikers in 1988, which increased to over 40,000 in 2011. Much of the increase on these two trails has been attributed to the shuttle system, which provides access to visitors without a car. While the shuttle does allow more access, it has inherently created overcrowding and impacted resources. The perception of crowding is based on expectations or the lack of knowing what to expect. First-time visitors generally accept the current situation as normal and therefore are more tolerant to crowding. – Change their attitude or perception about crowding. – Change the time of day or season to visit. – Visit a less popular location in the same area. – Do not visit (this is the least-used coping mechanism). The influence of culture on crowding norms appears to be related to crowding acceptability. Those in “contact cultures” or more socially oriented cultures, such as in Asian countries, were found to be more tolerant of crowds and even less likely to enjoy areas with very few people in it. Research suggests crowding to be a personal evaluation based on culture, previous experience, expectations and an inward ability to accept and change as needed. If one were to take a group of people experiencing the same thing at the same place and time, their evaluation of crowding would be as diverse as the people in the experience. Most importantly, it appears that crowding perception is site specific. Therefore, taking research results and applying them to other parks or outdoor areas may not work. Each site is as diverse as there are outdoor sites to visit and recreate in. Solutions then are site specific and visitor specific. In areas such as the front country in parks or highly developed recreation sites, one researcher suggests that management of crowding should focus on “limiting rude, depreciative and dangerous behavior” rather than trying to preserve certain types of psychological experiences. It does appear that people who act in disorderly ways (e.g. littering, getting too close to wildlife, loud voices or other detrimental environmental impacts) bothered other visitors more than the number of visitors. This suggests some possible solutions: 1) More ranger “boots on the ground” for educational and control purposes; 2) a new way of educating visitors before entering the area, or 3) additional fines to visitors. 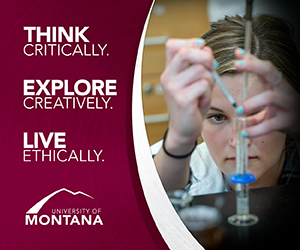 Researchers also recommend that sufficient space for the activities be pursued. In unique places, like Yellowstone and Glacier, it is not possible to increase the number of geysers or expand Going-to-the-Sun Road. One cannot control where and when grizzly bears hang out by the roadway. Visitors are here to see that bear and get their wildlife photo. However, some solutions to sufficient space for activities, such as wildlife watching, would be to highlight areas outside national parks that have equal wildlife opportunities, such as the National Bison Range, the multitude of wildlife refuges including the C.M. Russell Wildlife Refuge and various other hot spots within Montana. Such actions serve to disperse the visitors and reduce concentration in hot spots highly susceptible to crowding. Since crowding is site- and visitor-specific, it seems logical that managers of parks and outdoor recreation areas be allowed to enact management techniques as they experience visitor behavior becoming unacceptable and environmental conditions deteriorating. These managers know their landscape and situation better than most and should be able to decide what is good for the land and what may work for most people. Surveying visitors about trade-offs is one way to get the management decisions started. Other possible ways to determine limits is to assess the capacity of the current infrastructure. 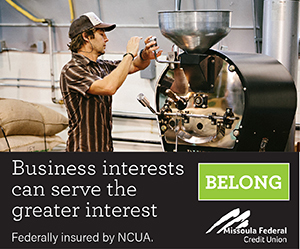 Additionally, safety measures due to emergency situations could provide a limiting number. 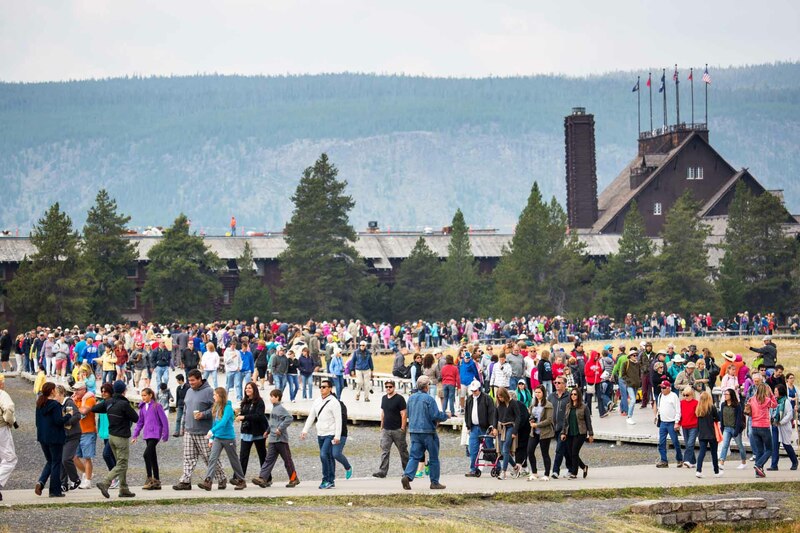 For example, how quickly a park can evacuate all visitors in Glacier or Yellowstone when a wildfire explodes is influenced by the number of vehicles in the park. Knowing the acceptable evacuation time can help managers determine the maximum number of vehicles allowed for safety measures. With current visitation trends over the past few years Glacier and Yellowstone managers are planning for uncertainty.